Thunderstorms are rolling across the summer sky. Every time one breaks, Rose Bowan loses consciousness and has vivid, realistic dreams about being in another woman's body. In France, where I grew up, Little Sister would be at home in my favourite genre: le fantastique. As Wikipedia describes it: “What is distinctive about the fantastique is the intrusion of supernatural phenomena into an otherwise realist narrative.” Fantastique is my favourite genre because it very much deals with how we human reacts in the face of events we don’t understand. Do we freak out? Do we try to find a rational explanation? Do we take advantage of it? Or maybe all three, just like in Little Sister. The main character of Gowdy’s new novel is Rose, the manager of a struggling independent movie theatre whom she inherited from her late father. She is very badly overworked. Also, her mother is developing dementia and recently started blurting out dirty jokes. As to her boyfriend, he is a nerd of the obnoxious type who turns any emotional statement into an Ikea instruction manual. It’s fair to say that Rose is somewhat dispirited. Then, on a Toronto stormy day, a clap of thunder gives Rose a glimpse to another existence. She becomes a voiceless host in a mysterious woman’s body, and witnesses a few minutes of what seems an incomparably more exciting life. Just as suddenly, she’s back in her own body, stunned and nose-bleeding. As she scrambles to make sense of her experience, a few other storms lash Toronto the following days and cause similar “episodes”, offering a fuller and maybe bleaker picture of the mysterious woman Rose is inhabiting. So, her boyfriend blames the whole thing on migraines and food additives. Rose, on the other hand, decides to search for the mysterious woman. As for me, I was wondering if she was simply losing it, in some kind of epic delusional burnout. This is why Little Sister screams Fantastique to me: the doubt surrounding the main character’s sanity as well as how her attitude evolves towards the “episodes” as they keep coming. (note: you do get to know if the mysterious woman exists or not… if you read the book). This points at the strength of Little Sister: the characters, their development and expression. The book has such a collection of fascinating, vividly fleshed out characters that I find it worth reading just for that. I enjoyed how Rose matured through the story, and how the personality of the mysterious woman subtly “bled out” on her. Rose’s mother Fiona is such an attaching and humourous character despite—or maybe because of—her condition. Rose’s boyfriend is hilarious, although mostly because he isn’t mine. The ex-convict new employee at the theatre brought some gentle wisdom to the story. Under Gowdy’s pen, characters appear unique and alive, and most importantly they seem real. The writing is so natural that Little Sister feels like a memoire at times. I really appreciated Gowdy’s talent. Unfortunately, my enthusiasm for this book was cut short by the story’s unspectacular ending. First, major questions are left unanswered. Second, it is so mundane and anti-climatic in regards to the extraordinary experience of Rose! Even though it had a heartwarming quality to it, my first—and subsequent—thought was “oh, that’s it?”. I was really expecting more. 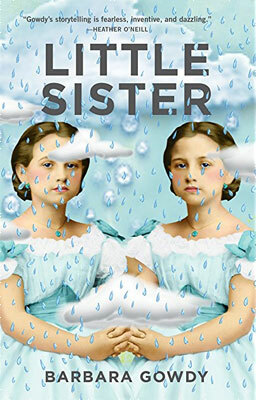 Nevertheless, I can’t ignore the great time I had with the characters of Little Sister: it was captivating, humourous and relaxing to read. Because the ending might leave you a bit deflated, I’d recommend to focus on the journey more than the destination. Indeed Little Sister‘s plot is a bit weak yet it is hard to hold a grudge when the storytelling is so good. I love Barbary Gowdy, but this is by far my least favourite book of hers. I too was disappointed by the ending.